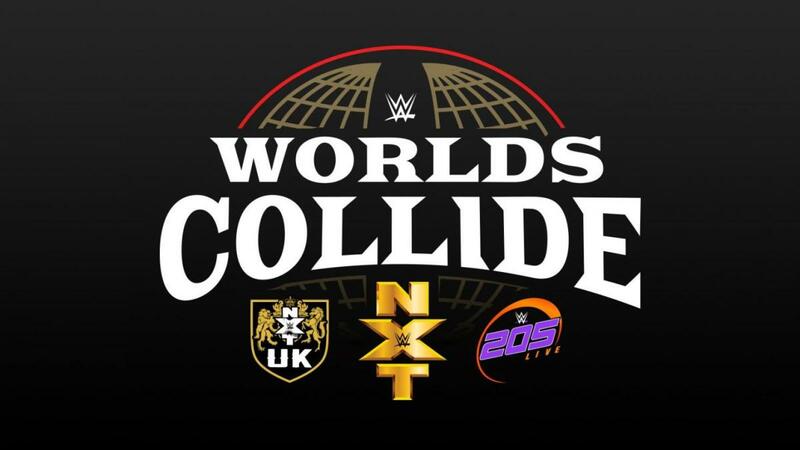 WWE Worlds Collide is a new tournament concept for the company that took place at Royal Rumble Axxess. It showcased NXT, NXT UK, and 205 Live, with the winner of the tournament getting a title shot of their choosing on one of those brands. The name itself pays homage to the legendary When Worlds Collide event that WCW and AAA ran in 1994 that was first used by ECW. Mike Rome started the WWE Network special off with a graphic announcing that a 15-man battle royal will determine the tournament's first round matches. The winner receives a first-round bye. Much like PRIDE, the various competitors were brought out before the crowd -- giving this a different feel to anything WWE has done since the Cruiserweight Classic. PRIDE's Lenne Hardt would've done a far better job than Mike Rome at making them seem like larger-than-life personalities coming out on stage, though. Cedric Alexander was eliminated early on by Velveteen Dream. TJP worked over Adam Cole briefly, then Keith Lee roared half the guys off of him before battling Dominick Dijakovic. Dream took out Shane Thorne. Tony Nese landed a giant knee on Cole, then TJP took Cole out with a wrecking ball dropkick before Nese cut the best promo of his career -- mocking Cole by yelling "TWO OH FIVE BAY-BAY!" Jordan Devlin took Travis Banks out by countering a suplex on the apron. Dijakovic and Lee stiffed each other in the corner and had a great hoss battle before Lee was taken out with a big boot by Dijakovic. The remaining field eliminated Dijakovic before Dream hit everyone amid a huge "Velveteen" chant. Dream took out TJP with the best elimination from any battle royal in ages by sending him over the buckles on one side of the apron to the other and flipping him over the top. Dream eliminated Nese before Devlin dropkicked Dream out to win, with Devlin receiving a chorus of boos. Tyler Bate, Zack Gibson, Mark Andrews, Humberto Carrillo, and Drew Gulak were also entrants in the battle royal and got eliminated. Gibson started things off with great physicality by attacking Carrillo the second the bell rang. Carrillo used his fast-paced style to evade and got a quick cradle for two. Carrillo hit a gorgeous second rope springboard arm drag that was pure poetry in motion as he moved off the ropes. Gibson tried to ground him, but Carrillo escaped, wound up, and slung a few haymakers at him in the corner to show that he can fight just as hard as Gibson can. A hesitation missile dropkick hit for Carrillo and a standing moonsault got two. Gibson hit the tombstone codebreaker for two before Carrillo hit a flying front kick off the rope and won with a handstand Arabian press. Clips of the other first round matches aired after a graphic showing the rest of the field's matches heading into the quarterfinals. Gulak defeated Andrews, Dream defeated Nese, Cole defeated Thorne, Dijakovic defeated TJP, and Bate defeated Cedric Alexander. The quarterfinals also mostly aired in clipped form, with Adam Cole defeating Keith Lee in a match that would have certainly benefited from being aired in full on the Network special, while the complete Devlin vs. Gulak match was shown next. Gulak and Devlin started off with a mat wrestling clinic that led to a stalemate. Things turned physical when Devlin went for a kick and Gulak slapped him hard right in the jaw. Gulak worked away with a chancery before Devlin escaped and hit a standing moonsault for two. Devlin landed a back suplex into a backbreaker, but Gulak recovered and headbutted him before landing a back elbow. They exchanged slaps before Devlin landed a jumping knee and Gulak backhanded him for a double-down. Devlin flipped out of the Gu-Lock and landed on the apron for an outside-in cutter. Devlin set Gulak up in the corner and smashed him with an elbow before making a mistake. Gulak got a combination ankle lock/sharpshooter that was very much like Edge's old Edgeucator move. Gulak hit a corner lariat, but Devlin absorbed it and hit Ireland's Call to win. This was the best showcase Devlin has had yet, while Gulak showed off a more physical side than usual. Vic Joseph and Nigel McGuinness talked about how great the tournament matches have been so far -- including the ones we didn't see in full on the special, which seems bizarre. Bate used Johnny Saint's escape for a hammerlock. Cole sent him down and teased the Last Shot before delivering a chinlock. Cole hit some Jericho-esque cocky kicks before Bate fired up and locked on the Airplane Spin and hit an uppercut for two. Cole hit a corner charge, but Bate hoisted him up and hurled him overhead like he was Rick Steiner in his prime. Cole hit a pump kick and a brainbuster on the knee for two. They battled on their knees with forearm exchanges before Cole landed a shining wizard for two. Bate hit the handspring lariat and a Tyler Driver '97 to win. This was fantastic and a great way to make Bate into a star -- if they'd done this on a post-Raw tournament show, it might have done just that. Dream started things off quickly by going for a Dream Valley Driver, but Devlin got free and worked on Dream's injured ribs. Devlin took him down and hit a standing moonsault before striking Dream's pose. Devlin choked him in the corner to make breathing even harder for Dream. Devlin stretched him before striking the ribs. Dream ate more damage to the ribs and went for the Dream Valley Driver, but Dream struggled to hit it and threw Devlin off into a superkick for two. Dream went up for the Purple Rainmaker until Devlin grabbed him and went for a powerbomb off the apron. Dream escaped and hit a moonsault off the apron. Devlin hit a backstabber for two. The Dream Valley Driver was countered again, but the Rainmaker DDT hit. Devlin landed a big headbutt and hit a backdrop driver for 2.9. He went for a moonsault, but Dream got his knees up, hit the Dream Valley Driver, and landed the Purple Rainmaker to get the win. Dream came out in a stunning glittery silver robe. He tried to outwrestle Bate to start, which didn't work out well as Bate rolled through a bunch to evade. Dream won a floor brawl and sent Bate in for a double axe handle, but Bate slugged him. Bate elbowed the ribs for two and then applied a tight abdominal stretch. Bate worked away with a variety of holds before Dream hit a few punches to show some life. Dream ate a koppu kick and hit a Dream Valley Driver after a combat roll for two. Bate hit the bouncing lariat and the Tyler Driver '97 connected, but it only got two. Bate used the Billy Goat's Curse and stood on the head -- and man does Bate work shockingly well as a heel just modifying his style a small bit. He still focuses on mat wrestling, but he's far more aggressive -- just shifting the focus of every move to hurt instead of to wear down changes the intent of his character. Dream escaped the Boston crab and hit a series of kicks before a small package got two for him. Bate avoided Dream's attempt at a Tyler Driver with a rana and got 2.9 off of it. A "fight forever" chant broke out as Bate rolled outside and Dream hit an axe handle off the top to the floor. Dream went up for the elbow, but he ate a big headbutt. They fought up top -- and Bop and Bang hit for Bate. He wanted a super Tyler Driver, but Dream backdropped him and the Purple Rainmaker won it for Dream! Dream and Bate shook hands and hugged after the match. Dream now gets a title shot of his choosing on either NXT, NXT UK, or 205 Live. As a tournament, this was greatly hurt by so few of the matches airing in full on the Network special. Fortunately, everything that aired was high quality and they did try to make stars in Devlin, Dream, and Bate -- with Cole also shining brightly before losing. The 205 Live roster felt very marginalized here, which is minor in the grand scheme of things, but the stars of that show need to look as strong as possible given how 205 Live is essentially purgatory for them. They told a great babyface story with Dream overcoming the odds despite a rib injury, and Bate did his best heel work in WWE yet. Devlin needed something to not come off as Finn Balor-lite, and his work here was a perfect showcase for what he can do. If WWE does something like this again, they need to air everything in the tournament or just truncate it -- because the cliff notes version didn't work as a broadcast.